Community Park with Ball Fields, Basketball Courts, Greenway Access, Picnic Facilities, a Playground, Restrooms, Picnic Shelters, Soccer Fields, Tennis Courts, and Water Fountains. Hours of Operation: Sunrise to Sunset. 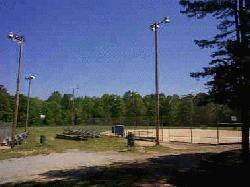 Contact City of Durham for Hours of Operation for the lighted portions of the Park.